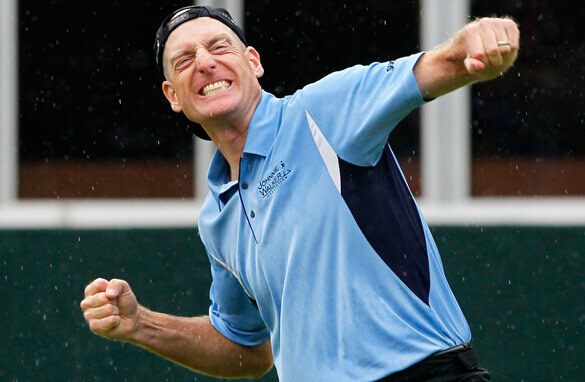 Jim Furyk's victory at the FedEx Cup playoffs has given the U.S. Ryder Cup team a lift. It's already advantage team USA ahead of this week's Ryder Cup in Wales. Jim Furyk held off the challenge of England's Luke Donald at the Tour Championship to give the Americans' confidence a boost. After banking the tidy sum of $11.35 million over the weekend, Furyk immediately turned his attention to his country's defense of the trophy. His success at East Lake in Atlanta was the second biggest win of his career following his 2003 U.S. Open success and once again golf's "Mister Unflappable" showed at the age of 40 he's still very much a formidable opponent. In fact, the Ryder Cup theme had been a sub-plot to the tournament all week. Nine players in the field will be on duty for the U.S. team later this week in Wales and there's no doubt in my mind, the top performers among them here at East Lake will have arrived at Celtic Manor in fine spirits. Englishman Luke Donald must have felt a little bit in isolation. He was the lone European Ryder Cupper and at times even he tired of the continual questions about Colin Montgomerie's decision to omit the in-form Paul Casey – who continued his fine form of late in Atlanta. In fact, since learning he wouldn't be on the team, the Englishman has shot six straight rounds in the sixties. While denying he was trying to specifically prove Monty wrong, he did say he wouldn't mind one little bit if that particular stat got printed in the morning papers! Has Montgomerie blundered over Casey? We shall see. I was at Kentucky two years ago to see the U.S. comfortably regain the Ryder Cup. Paul Azinger's men were superbly organized and in the end Nick Faldo and Co. were no match for their opponents at Valhalla. I think the tag of underdogs suits Corey Pavin and his team right down to the ground. Don't be fooled into thinking Europe will win at a canter. The U.S. have terrific team spirit and will to win. Despite reports to the contrary over the years, this is a tight-knit bunch. Many of these American stars are close friends and I for one will not be surprised if they do enough to retain possession of this prestigious title. I asked that man Furyk in the aftermath of his FedEx Cup success who will emerge victorious in Wales. His confident yet terse response said it all: "Us."